On average, bonded retainers last around 3 years for upper teeth and 5 years for lower teeth. Removable retainers can last anywhere from 6 months to 3 years, for products such as Essix, and 5 to 10 years for Hawley products. Retainers are just a reality of life for millions of us. Even after your braces are just a distant (and unpleasant) memory, the retainer remains a fixture of your mouths inner workings­–literally speaking. So, how long can you expect yours to last before you’ll need to replace it? 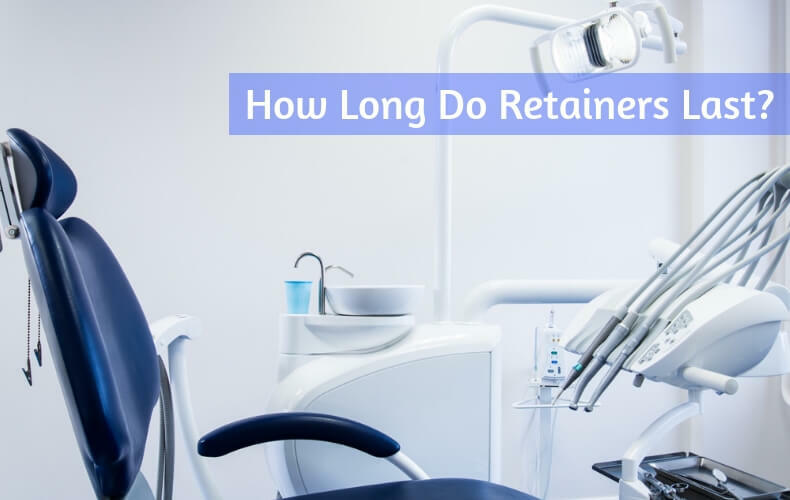 The answer to this question depends highly upon which particular type of retainer you have. There are two basic variations on the classic retainer design used today; bonded, and removable. Bonded retainers are considered permanent, as they cannot be removed by anyone but a dental professional. Essix is one of the better-known names in the removable retainers industry. This particular product is laboratory made with the highest quality materials and it is fitting for both upper and lower teeth. It is 1mm clear and super thin, making it quite comfortable to wear. In general, these types of retainers will last you about 3 years on your upper teeth, and up to 5 or more years on your lower set. This is because the lower teeth usually don’t see as much action during daily use, so there’s less wear and tear down there, overall. Removable retainers, on the other hand, can be taken out as needed. This means more fiddling with them in general, however, which tends to lower their effective lifespan a bit. There are two main brands of removable retainer on the market today, Essix and Hawley. Essix retainers are a clear piece of plastic that fits directly over the teeth. Hawley, on the other hand, have a fixed base supporting wires that wrap around the teeth themselves. Essix can last anywhere from 6 months to up to 3 years, with the proper care. Hawley designs are hardier and can last anywhere from 5 to 10 years depending upon a variety of factors. Retainers, as their name implies, help to retain the shape and alignment of your teeth after having corrective measures taken, such as braces. Though they are most important in the months directly following a dental procedure, they should ideally be sued for life to ensure that your teeth do not ever shift back into their original position again. With bonded retainers, you’re mainly watching out for the glue that bonds the wire to your teeth. Over time, this adhesive tends to wear down, and the wire can even become loose without you even noticing. Try and keep this area clean, and get regular checkups to ensure that nothing is out of place. With removable retainers, the main issue is simply the wear and tear involved from repeatedly putting in and taking out the device. Hot water also poses a threat to Essix retainers because it can cause them to lose their shape, so it’s best to use lukewarm water when cleaning them. Hawley retainers have a tendency to break off at several points attached to the base, so you’ll need to watch out for this when cleaning them as well. In general, the best way to prolong the life of your retainers, regardless of which style they are, is to be gentle with them whenever possible. Try not to play with them in your mouth very often, and during cleaning, be very careful not to damage anything. Do this, and you’ll find that these crucial–if annoying–little bits of plastic and metal will last you much longer, saving you the headache of getting them replaced as often.